An OASDI [Old Age, Survivor's and Disability Insurance] underpayment accrues when a beneficiary is due a partial or full monthly benefit amount that has not been paid. SSA’s automated systems should detect and process most underpayments due living beneficiaries. However, when SSA’s systems cannot process these underpayments, SSA employees must manually issue them. Further, SSA employees must manually process all underpayments due deceased beneficiaries. 17 underpayments totaling $20,887 less than what was due the beneficiaries — we project that for 70,880 underpayments, SSA did not issue approximately $87 million that was due. You might think that the solution would be to just require supervisory approval of all underpayments but there are two problems with this. First, it would require more staff time and the agency lacks the personnel to get its current workload done. Second, supervisory approval would only get you so far. Supervisors also make mistakes, especially when they're overworked. If you want better performance from Social Security, you're going to have to give the agency additional operating funds. Schizophrenia is a truly horrible disease. It's tragic to see once promising young people reduced to unstable, unproductive lives haunted by the madness of schizophrenia. Schizophrenia always starts before age 30 but continues for the rest of a person's life. There is no cure for schizophrenia. The treatments available generally make long term institutionalization unnecessary and can prevent frequent hospitalization but do little to restore normal functioning. In particular, the treatments available don't touch the negative symptoms of schizophrenia -- lethargy and inability to have appropriate emotional and social responses. The negative symptoms may not sound that bad but they are actually devastating. Everyone familiar with the disease prays for some treatment that would improve the lives of schizophrenics. One approach to schizophrenia that seemed to have promise was early intervention -- identifying schizophrenics as soon as possible and offering them intensive treatment. This led to various Recovery After an Initial Schizophrenia Episode (RAISE) studies funded by the National Institutes of Mental Health (NIMH). Conclusions: A 2-year coordinated specialty care intervention did not reduce receipt of SSA disability benefits. There were some advantages for those who obtained SSA disability benefits over the 2-year treatment period, but there were also some unintended adverse consequences. Providing income supports without impeding recovery remains an important policy challenge. The Social Security Subcommittee of the House Ways and Means Committee held a hearing yesterday on antifraud efforts at Social Security. The hearing was more notable for what didn't happen than what happened. There was no new announcement of some fraud ring preying upon Social Security. I'm not sure how much longer Republicans will try to milk the Conn case but they don't have a new case to talk about. The agency witness talked about anti-fraud computer systems that Social Security has installed. Apparently, a fair amount of money and time has gone into this. However, the agency witness didn't have anything to say in his written remarks about fraud that had been uncovered using these systems. Maybe it's too early to expect results from these systems, maybe Social Security hasn't tried hard enough to make the systems work or perhaps organized fraud at Social Security is actually quite uncommon. I think the Republican leadership of the Subcommittee would really, really, really like for Social Security to uncover lots of organized fraud since that would be in keeping with their political and social beliefs. I think they're going to be disappointed. If there is anything organized, it's probably quite small and more likely involves Social Security employees than members of the public. Update: Here's a report from the right wing Washington Times on the hearing. You can sense the disappointment pervading the piece. It's simply too risky to assume you will indeed be able to work longer. A survey by the Transamerica Center for Retirement Studies (TCRS) found that nearly two-thirds of retirees left the workforce earlier than expected because they were laid off, reorg-ed out of a position, or due to general unhappiness with a job. Only 16 percent of retirees who exited the work force earlier than they expected did so because they felt they could financially afford to. And they're not even mentioning the effects of health conditions on retirement decisions. Raising full retirement age to 67 was a bad idea. Increasing it further would be a terrible idea. People need security in retirement and Social Security is the only assurance that the vast majority of Americans have or will ever have. It's become apparent to me that most of the comments posted on this blog are now coming from two sources, paid shills and cranks. The shills bother me worse than the cranks. When I see multiple comments filed at 3:30 in the morning all saying that government employees are lazy, Social Security is horribly inefficient and its management is corrupt, I'm pretty sure it's been posted by paid shills who are seeking to undermine funding for Social Security. Russia isn't the only one who employs these shills. It's a cheap way to influence public opinion. Trump's election suggests that it can make a difference. Yes, I do believe the Koch brothers and others are this devious. I will now moderate the comments. If you submit a comment, it won't be posted until I have reviewed it. I'll try to act on the comments promptly but I'm not making any promises on the time frame. I have a life. I'm going to reject repetitive or abusive comments. I'm not planning to censor them otherwise. It's my blog so I get to make the decisions. I'd be delighted if others would start their own Social Security blogs. Many voices should be heard. The National Bureau of Economic Research has done a study on increases in life expectancy and retirement benefits in the United States. A few years ago when this study was begun there was much talk of increasing the full retirement age for Social Security benefits. That talk has mostly died away. It's politically impossible now. It's hard to imagine it becoming politically possible in the foreseeable future. Perhaps the least unlikely change would go in the opposite direction -- lowering the age limit for Medicare from 65 to 50 or 55. There is a fair chance of that happening should Democrats control the White House and Congress after the 2020 elections or even if Democrats control Congress after the 2018 elections. The study points out what was already well known, that while there has been an increase in overall life expectancy, those with lifetime earnings in the lowest 40% are experiencing little or no increase in life expectancy. This is increasing the gap in lifetime benefits between those with the highest and lowest lifetime income by $130,000. To explain this, the 1930 cohort is people born in 1930 and the 1960 cohort is people born in 1960. Quintile 1 is the 20% of people who have the lowest lifetime earnings while quintile 5 is the 20% of people who have the highest lifetime earnings. Note that there was essentially no change between the 1930 cohort and the 1960 cohort. People make silly arguments about how different generations of people are vastly different. I've never seen that. 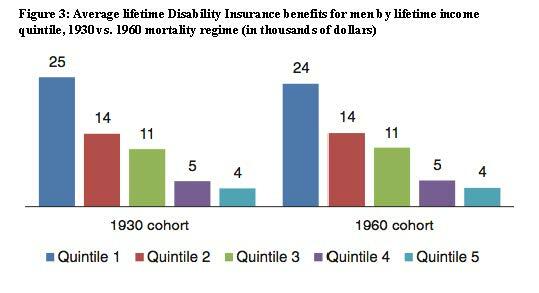 Note that poor people are much more likely to draw disability benefits than wealthy people. It shouldn't be hard to understand why. 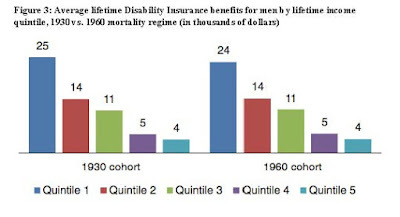 The same factors that make people poor make them more likely to become disabled. Low cognitive abilities, low educational attainments and serious chronic mental illness all predispose to both poverty and disability. Also, poverty leads to poor health care access which also predisposes to disability. None of this has anything to do with rural versus urban poverty. There's just more poverty these days in rural areas than urban areas. U.S. Social Security has its problems but it does an excellent job of protecting data security. Look to India for an example of how things can go very wrong. Somehow, the names, addresses, bank account information, and Aadhaar number (the equivalent of a U.S. Social Security number) of 1.4 million Indians were posted on a Indian government website. Disability advocates remain livid about that Washington Post piece that wrongly suggested that any poor person could get Social Security disability benefits just by asking. Why So Much Disability In Rural Areas? I'm not sure exactly what The Center for Michigan is but they have posted a long piece about the high rate of disability in poor regions of the state. You wonder if they, unlike the Washington Post, have their numbers right. As I've said before, the high rate of disability in poor rural areas is nothing new. It's been a prominent fact for me since I started in the private practice of law in 1979. It's where my clients are clustered. As I've also posted, I see nothing surprising in this. Younger, healthier, smarter, better educated individuals leave poor rural areas to find jobs in urban areas. The population left behind is on average older, sicker, less smart and less well educated. These are all factors that lead to higher rates of disability. People who live in poor rural areas have poor access to health care. Poor access to health care also predisposes to disability. The subtext of pieces such as this is that these people aren't really disabled; they're just poor. And all these poor people who aren't sick getting on Social Security disability just shows how lax the standards are. The solution, of course, is to tighten up on disability and enact policies which "grow" the economy. Of course, the best way to "grow" the economy is to cut taxes on the wealthiest Americans. I think virtually everyone actually involved in the Social Security disability process knows it's quite difficult to get on Social Security but that's not what people are hearing. By the way, pieces like this don't simply arise out of a reporter's curiosity. Whenever you see David Autor quoted, you can bet that a Washington think tank supported by Koch brothers money planted the piece. All these pieces seem like they come out of a cookie cutter which is why I sort of expect that the stats quoted might be wrong. The McCrery-Pomeroy SSDI Solutions Initiative, which is part of the Committee for a Responsible Federal Budget (CRFB), has issued a book containing "Ideas to Strengthen the Social Security Disability Insurance Program." CRFB is officially bipartisan and has Democrats as well as Republicans on its board. However, it is closely affiliated with Pete Peterson who seems to have cutting Social Security as his primary goal in life. 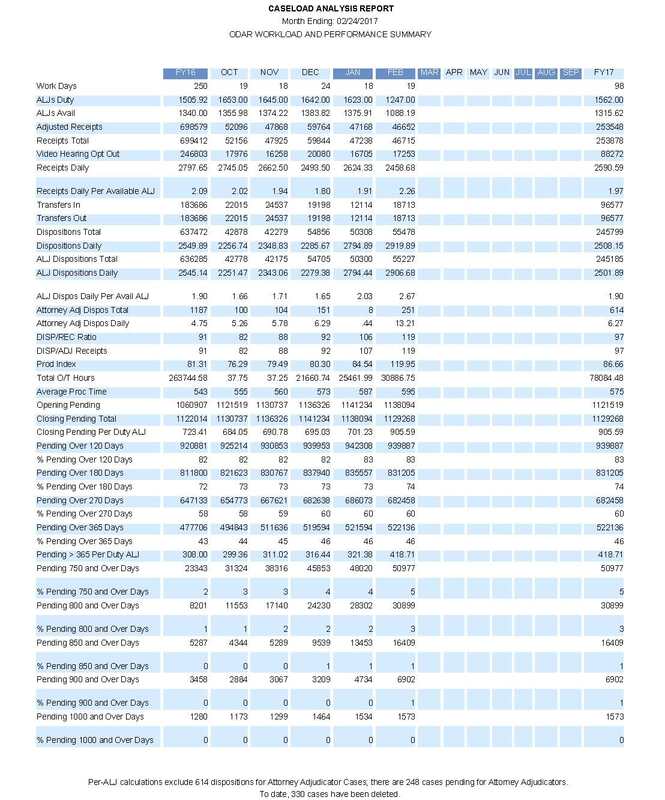 Peterson has huge wealth to support his mania. The book has been out for a month or two but has not been promoted, probably because there's little in the book that would actually bring about cuts in Social Security disability or which is practical. The book is a mishmash with each chapter by a different author or group of authors. For the most part, I'd say that few, if any, of the authors have ever met a Social Security disability claimant or recipient. It seems to mostly be "blind people describing an elephant" or perhaps describing how they would build a better elephant. I think that if the authors of this book had to actually try to help real, live Social Security disability claimants that they would be likely to say "Who knew disability could be so complicated?" What is clear to me from all three papers in this section is that there is neither completed research nor an evidence base upon which to enact nationwide early intervention or work support programs. Additional study and evaluation will be needed to generate this evidence; certainly before making changes to the SSDI program. However, even this statement assumes that such evidence would be forthcoming if the "additional study and evaluation" is done. I think there's strong reason to doubt that. There already is a good deal of "early intervention" in workers compensation cases, at least where I am. All I've seen from that is heavy-handed pressure on claimants to resume work, even for brief periods of time, not because the injured person achieves any long term benefit but because it helps the employer's insurance company limit what it has to pay. I've seen no evidence that it has done anything to reduce reliance upon Social Security disability benefits. If there were such evidence, I think one of the authors of this book would be touting it. Otherwise, the book makes recommendations such as eliminating reconsideration, introducing some sort of government representative at hearings, encouraging private long term disability insurance, performing more continuing disability reviews, time limited disability benefits, partial disability benefits and changing the definition of disability. I'm not going to bother to discuss any of this since none of it could possibly be adopted at this time or at any foreseeable time in the future. Yes, for example, doing away with reconsideration would be nice but it would cost a lot of money since far more people would request hearings and hearings are more expensive so it's not going to happen. If you really think this is possible, you fail to understand the problems that Social Security has in getting enough money to continue its current operations much less more money to fund a more expensive version of its operations. Overall, when I read this book, I keep thinking the authors are nothing more than amateur dilettantes whose "advice" to Social Security policymakers is no more valuable than the "advice" I might give to the head coach of an athletic team I follow. In 2015, the GAO created the Fraud Risk Framework as a guide to federal agencies in developing antifraud strategies by using leading practices for managing fraud risk. As part of the framework, the GAO recommends that agencies like the SSA conduct a fraud risk assessment and develop their antifraud strategies based on identified fraud risks. In response, Chairman Johnson requested the GAO to conduct a study of the SSA’s implementation of the Fraud Risk Framework and to provide an analysis of the SSA’s antifraud activities. GAO will release the findings of its study at the Subcommittee’s April 26 hearing. Tomorrow we commemorate the 168 Oklahomans who died on April 19, 1995, when a bomb destroyed the Alfred P. Murrah Federal Building in Oklahoma City. The nation suffered a great loss with this act of terrorism and we experienced our own personal sorrow with 16 Social Security employees being among the fatalities. Today, the Oklahoma City National Memorial & Museum stands where the Murrah Building once stood. The museum chronicles the journey of loss, resilience, justice, and hope – something we can all build from and remember. Please join me tomorrow in a moment of silence at 9:02 a.m., to remember those lost and their loved ones. After being criticized for inaccuracies in Disabled, Or Just Desperate?, the Washington Post has issued a "correction." However, as Rebecca Vallas, Rachel West and Katherine Gallagher Robbins point out, the "correction" doesn't go anywhere near correcting all the mistakes in the misleading article. Take a look at the memo that Mick Mulvaney sent out to all federal agencies on the subject of "Comprehensive Plan for Reforming the Federal Government and Reducing the Federal Civilian Workforce." The amount of naivete and arrogance contained in this one memo is just stunning. It's what you get when someone takes all the nonsense spewed out by Fox News seriously. Of course, the federal government is just crammed full of waste, fraud and abuse. Of course, all it takes to end this and bring about dramatic reductions in government expenditures is for a tough-minded businessman to come in and demand that agencies become efficient. Like Donald Trump, Mick Mulvaney will have to learn on the job and to do that he's going to have to abandon many of his cherished beliefs. One way or another, he's going to be defeated by his job because the federal government is vastly more complicated than he believes and he really has no idea in the world of how to "reform" it. He doesn't know it but there have been endless attempts to "reform" the federal government. Mick Mulvaney doesn't know it but he isn't smarter than his predecessors. The Center for American Progress also reached out to the Post to ask about their data. The Post confirmed in an email exchange that they did indeed rely on publicly available data, and identified the specific reports, tables, and figures they used. The analysis overcounts working-age people receiving disability benefits by nearly 500,000. The SSA doesn’t publish county-level data on SSDI beneficiaries in the age range the Post defines as “working age” (18 to 64). SSA’s OASDI Beneficiaries by State and County report does provide county-level data on SSDI beneficiaries (Table 4), including disabled worker beneficiaries. However, of the 8,909,430 disabled worker SSDI beneficiaries whom the table breaks down by county, 472,080—or about 5 percent—are age 65 or older. Including these older disabled workers would inflate the share of working-age people with disabilities. "From A Dud To A Stud In Less Than 14 Months"
The Social Security Administration has turned its disability case processing system from a dud to a stud in less than 14 months. Over the previous four years, SSA had spent almost $300 million for software and had little to show for it. Rob Klopp, the Social Security Administration’s outgoing chief information officer, said SSA did a complete turnaround with DCPS by taking over the management of the project, applying an agile or dev/ops approach and listening to their customers at the state level. SSA launched the first iteration of DCPS on Dec. 16 and expects to continue updates and deployments throughout 2017. By 2014, Klopp said he joined SSA and the program was in trouble and spending well above the initial $200 million estimate. SSA partners with State disability determination services (DDS) to evaluate disability claims and make disability determinations. The DDSs use various customized systems to process disability cases. DCPS is an SSA initiative to develop a common system for all DDSs that the Agency expects will simplify system support and maintenance, improve the speed and quality of the disability process, and reduce the overall growth rate of infrastructure costs. We put those payroll contributions there so as to give the contributors a legal, moral and political right to collect their pensions. … With those taxes in there, no damn politician can ever scrap my social security program. The concern about the low employment rates (EPOP) in the United States is reasonable, but it bears no obvious relationship to the Social Security disability insurance program. The EPOP for prime age workers (ages 25-54) has fallen by almost four percentage points since 2000, with no increase in the generosity of the disability program. In fact, if we combine the number of workers receiving disability and workers compensation, there has been little change in the share of the working age population receiving benefits over this period. Kenneth Nibali, formerly Associate Commissioner of the Office of Disability at Social Security, passed away on April 4. He was 69. Living Large On Social Security Disability? The Detroit Free Press is running a piece on a woman disabled by multiple sclerosis struggling to find a place to live. Her Social Security disability benefits aren't enough to enable her to pay rent, leaving her and her 16 year old daughter homeless. A patient dying of cancer is told her Social Security disability claim has been approved but she's also told that she must wait six months before she'll be paid a monthly check. The patient thinks that's crazy. Why would the Social Security Administration behave in such a brutal way? Because they have to. It's the way the law is written. Anybody want to justify this as reasonable? Anybody want to make an argument about discouraging dependency? What about "ENTITLEMENTS ARE DRIVING US BANKRUPT?" I put that last one all in caps since that's usually the tone of anyone making the "argument" even though the same people always favor humongous increases in defense spending. And if you think that six month waiting period is terrible, what do you think of the two and a half year waiting period for Medicare? Trump Wants To End FICA? A Washington Post editorial is calling for "reform" of Social Security disability benefits. I don't know how to characterize the editorial other than to say they thing "something" must be done. That "something" must encourage disabled people to work. The Post seems unfamiliar with the extensive work incentives that already exist in the Social Security Disability programs. It's a really incoherent editorial. Why Isn't The President's Photo Posted In Federal Offices? A newspaper in Wilmington, NC is asking why Donald Trump's picture isn't posted in federal offices, including Social Security, in that city. Is it some dark plot by Democrats? What I'm hearing is that it's not just Wilmington. The photos haven't yet been distributed. It hasn't been that long since Inauguration Day. By the way, whether it's a Democrat or a Republican in the White House, I don't see the point of posting the President's photo in federal offices. At best, it's a needless expense. The National Association of Disability Examiners (NADE), an organization of the personnel who make initial and reconsideration determinations on disability claims for Social Security, has issued its Spring 2017 newsletter. Wait Until Trump Hears About This -- Social Security Helping Foreigners Work In U.S.
“Seasonal workers must obtain a Social Security number before working in the United States, and the Cape Cod Chamber (of Commerce) has worked on behalf of its member businesses to implement special remote locations to assist with their overall business operations and the time it takes to travel to Hyannis to fulfill Social Security requirements,” a statement from the chamber says. Three Pinocchios For OMB Director Who Said Social Security Disability Is "Very Wasteful"
The Washington Post gives Mick Mulvaney, the director of the Office of Management and Budget (OMB), three Pinocchios for his statement that Social Security disability is "very wasteful." Below is the Workload and Performance Summary for Social Security's Office of Disability Adjudication and Review (ODAR) for the month ending February 24, 2017. 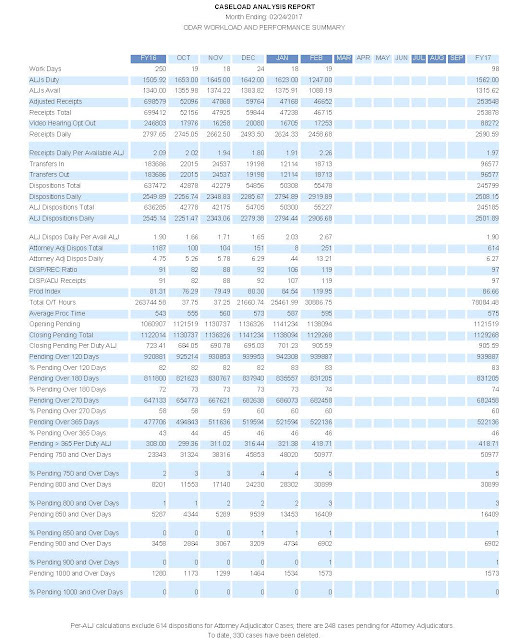 Click on it to view it full size. The National Organization of Social Security Claimants Representatives (NOSSCR) published this in its newsletter, which isn't available online. A former U.S. Postal Service mail handler was ordered to serve nine years in prison Wednesday for stealing close to $3 million in Social Security checks from a St. Petersburg mail-processing facility. A Kentucky lawyer facing prison time for a scheme to defraud the government of nearly $600 million in federal disability payments took another legal hit Wednesday when a judge ordered him to pay nearly $31.5 million in damages to the government and two whistleblowers. The ruling by U.S. District Judge Amul R. Thapar was the latest fallout for Eric C. Conn, the self-proclaimed "Mr. Social Security" who lived in a palatial home and was a frequent world traveler. Thapar ordered Conn to pay $12 million in damages and $19 million in penalties. The penalties represent the maximum $11,000 assessed for each fraudulent claim identified. "He doesn't have those kind of assets anymore," said Scott White, one of Conn's attorneys. The Social Security Administration (SSA) is issuing a final rule to amend its Privacy Act regulation exempting portions of a system of records from certain provisions of the Privacy Act of 1974, entitled Anti-Harassment & Hostile Work Environment Case Tracking and Records System. Because this system will contain some investigatory material compiled for law enforcement purposes, this rule will exempt those records within this new system of records from specific provisions of the Privacy Act. The Privacy Act allows individuals to inspect government records about them. This regulatory change appears to be intended to prevent individuals from inspecting these records. By the way, the website of the Office of Management and Budget (OMB) doesn't show this regulation as one that was even submitted for review. I would guess that the OMB website isn't properly reflecting what's going on. "Disability Isn't So Easy Even For The Desperate"
Lynda Waddington of The Gazette of Cedar Rapids, Iowa explains why Disability Isn't So Easy Even For The Desperate. "The Wheels Are Already Coming Off The Bus"
People living in the Roanoke area wait nearly two years. The local office ranks 155th, or 10th from the bottom nationally, in average case processing time, according to agency data. A hiring freeze ordered by the Trump administration means there’s little to no chance for a substantial increase in staffing to address the problem, according to an association of judges who work in the system. “I shudder to think what will happen if we don’t get significant relief from the hiring freeze. We desperately need support staff,” said Administrative Law Judge Marilyn Zahm, president of the Association of Administrative Law Judges. SSA has lost 1,400 field staff since the hiring freeze began. As a result, 18,000 field office visitors every day must wait more than an hour for service. Nearly half of visitors must wait at least three weeks for an appointment. SSA’s teleservice centers have 450 fewer agents than they need to handle the 37 million calls they receive each year. As a result, most callers to SSA’s national 800 number don’t get their questions resolved. The average wait for an agent is 18 minutes, and nearly half of callers hang up before connecting. Another 13 percent of callers get busy signals. SSA has been able to hire more staff to address appeals for disability benefits, in part due to the $150 million in dedicated funding that policymakers provided for this purpose in 2017. As a result, SSA has made initial progress in reducing its record backlogs. But that progress will disappear unless the President and Congress continue to provide adequate funding in the final 2017 appropriation bill and in future years. Why Do Claims Like This Get Denied? I just took on a client whose Social Security disability claim was medically denied even though the Disability Determination Service knew he recently had a Left Ventricular Assist Device (LVAD) installed. No, this wasn't some technical denial. No, there's no date last insured issue. They just flat said he wasn't disabled. An LVAD is a partial artificial heart. In this case, it's being used as a last ditch measure to help the patient survive until a heart transplant is available. This isn't the first time I've seen this sort of thing. I had another client recently who had an LVAD installed. He didn't make it out of the hospital alive after he had it installed. It was obvious he was headed in this direction but he was still denied.